Along with a very pleasing but shy personality she has very soft fine dense fiber terrific coverage and a beautiful face. 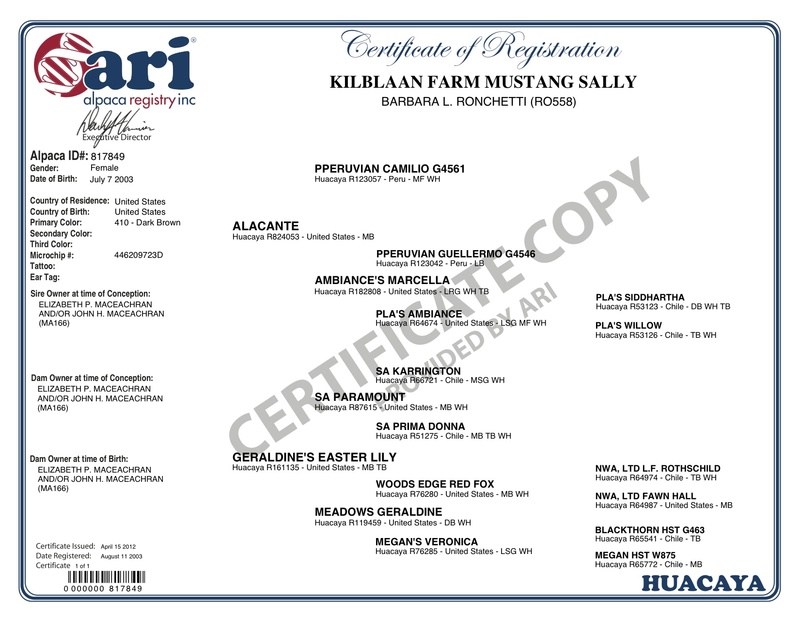 Her sire, Alacante, son Pperuvian Camilio, is a multiple blue ribbon winner, and has been quoted as having fleece like a rug. In 2005 Sally has blessed us with Pietro, a male, with incredible fineness; he was 18.5 Micron at 1-1/2 years old and just at 21.5 at nearly three years of age! With incredible luster and very high frequency crimp Pietro is abundantly covered with this fine fiber from his top-knot to his toes. He adds tremendous fineness to his offspring, as did Mustang Sally with him! 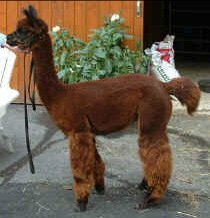 Sally gave us Apollo's Victory, whose sire was the Royal Peruvian Eros, who again, has been proven to be, yet another fine, lustrous gentleman. 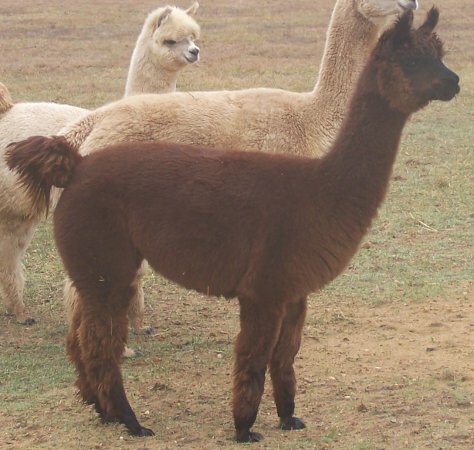 Her 2010 cria, equally impressive results: Estrada's Seina, with a micron in the 17's. If you like browns, she is your girl! 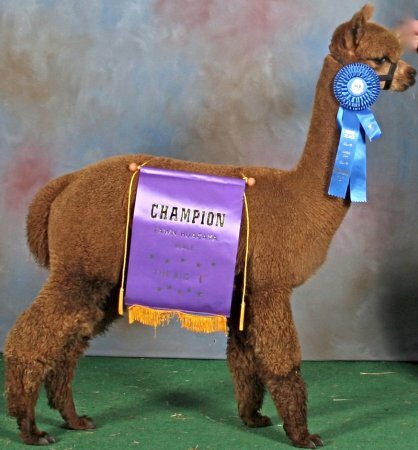 Please note, Sally herself took a third place ribbon in a strong class at the New England Coastal Classic. 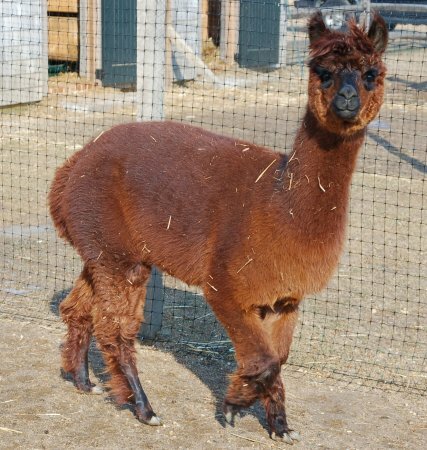 Lily is a wonderful dark red brown girl with black points. A great mom with loads of milk. Son of PPeruvian Camilio. Alacante has "fleece like a rug" with incredible density and crimp. 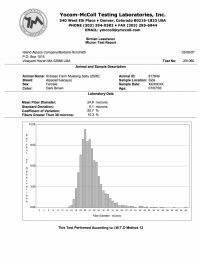 AFD 20 microns in 2001 25 microns 2004. 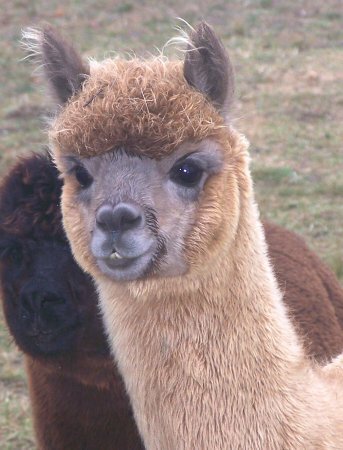 1st place Alpacapalooza 2001. 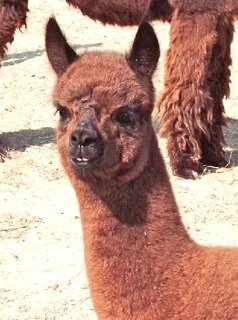 2nd place at AOBA National Halter Show 2001 and 1st place Big E 2002. 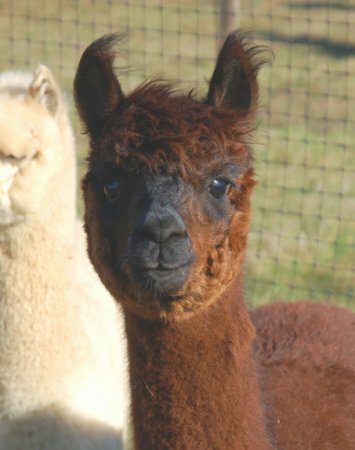 His genetics will be an addition to anyone's alpaca herd. 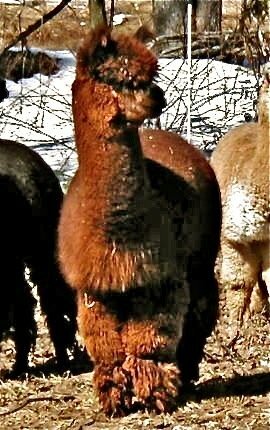 We see superlative fineness in his crias as we see in Sally's son Apollo's Victory.